At our initial consultation, I will discuss with you the various approaches to obtaining a divorce in New Jersey, whether it be in Bergen County, Passaic County or some other county in Northern New Jersey. There is the traditional litigated divorce, in which a complaint for divorce is filed in the Superior Court of New Jersey, Chancery Division, Family Part, Divorce Mediation or the Collaborative Divorce Process. I can handle your divorce no matter which of the three above avenues you choose. I am accredited by the New Jersey Supreme Court as a Family Law Mediator, as well as certified as a Collaborative Law Attorney, being a member of the NJ Association of Professional Mediators (NJAPM), the International Association of Collaborative Law Professionals, and the North Jersey Collaborative Law Group. In the “traditional” litigated divorce, the process begins by one spouse filing a Complaint for divorce against the other in the county where either spouse resides. Once the divorce complaint is returned by the court marked “filed”, my office serves the Complaint through a licensed NJ process server upon your spouse. (If the other spouse already has retained an attorney, the Complaint can be served upon their attorney). Once the Complaint is served, the other spouse has thirty-five (35) days to respond. That response is known as an “Answer” and typically, a “Counterclaim” is attached to the Answer wherein the served spouse also seeks a divorce and other relief. The relief typically sought in a divorce Complaint and Counterclaim includes not only a request for absolute divorce from other party, but an equitable division of the assets acquired by the parties during the marriage, custody and parenting time of the parties children, alimony and child support, and counsel fees. Sometimes, a Complaint or Counterclaim includes a personal injury component if one spouse has been abused or caused personal injury to the other spouse during the marriage. Once the Answer and Counterclaim is filed. the Court will then set up a “Case Management Conference” (CMC) which requires the parties and their attorneys to appear before the Judge handling the matter. In Bergen and Passaic County Family Court, it is usually mandatory that the parties appear. At that time. the Judge who knows nothing about the case, inquires of the parties through counsel if there are any major issues the Court needs to be aware of. These can include custody, a valuation of a family owned business or other large assets which require additional time for the Court to handle. The Court will also inquire at this time, as to whether or not any experts might be retained by the parties. For example, if there is a family owned business, the Court will ask if the parties will be requesting a forensic accountant to have the business valued. At the Case Management Conference, the Court will schedule a time period within which the parties must complete their discovery, or exchange of financial documents, experts reports, home and business appraisals, and the like. Once the discovery time period expires, typically within a matter of months, the Court will have the parties attend an “Early Settlement Panel” (ESP). This panel is located at the Courthouse, and is conducted by three (3) lawyers who volunteer their time to make recommendations as to how they think the case should settle. (I have sat on the Early Settlement Panel for over 20 years and can state there is a decent success rate in terms of getting the matter resolved at or after the ESP is concluded). The recommendations the ESP makes are non-binding and either party can choose to reject them. The Court is not allowed to hear what the recommendations of the panel are. If the panel is unable to settle the case, the Court then sends the parties to mandatory economic mediation. Both the Bergen County Family Division, and the Passaic County Family Division, have a list of economic mediators that the lawyers for both sides can choose from to do the mediation. The parties submit statements of their respective positions through their attorneys to the mediator, who then attempts to facilitate a settlement as to the unresolved issues. I have been on the Economic Mediation Roster for Bergen County and Passaic County for well over two decades and have successfully facilitated settlements of the issues that were presented to me through the parties counsel. Finally, if the economic mediation fails to produce a resolution, the parties and counsel must return to Court at which time the Judge sets the matter down for trial. The above is a rather shortened version of what the traditional-litigated divorce process entails. I would suggest that you phone or email my office to discuss in detail, not only the entire process from a procedural standpoint, but the substantive legal issues that are involved as well. 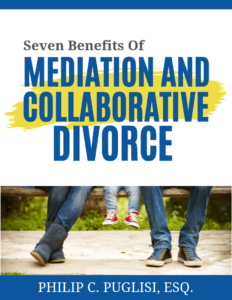 On the other pages of this website, I will discuss Mediation, and the Collaborative Law Process as alternatives to the traditional-litigated divorce. Are You Considering Divorce Or Dealing With A Family Law Matter? Philip C. Puglisi, Esq. can help. Mr. Puglisi has been practicing family law for just under 40 years. He is extremely competent, diligent, and experienced handling an extensive variety of family law matters from the simple to the complex. Call (201) 431-8400 to schedule a free consultation.